The Clipper Race fleet has enjoyed its first night of sailing in Race 2: The Stormhoek Race to the Cape of Storms, though the teams remain tightly bunched on the leader board after a windy and wild start to the race. At the time of publishing, Dare To Lead, Liverpool 2018, and Qingdao occupied the top three positions, but with only around 10nM (nautical miles) separating first from eighth, there is still everything to play for in the early stages of this race. Sanya Serenity Coast, Garmin, and GREAT Britain make up the rest of the tight leading pack, while Nasdaq is just over 20nM off the pace in ninth. Skipper Rob Graham reports: “Pleasantly surprised by how much more organised we were on board than when leaving Liverpool or Gosport – everything seemed to go to plan for the start. HotelPlanner.com, Unicef, and PSP Logistics, in tenth, eleventh, and twelfth respectively, have opted for a different southerly tactic. 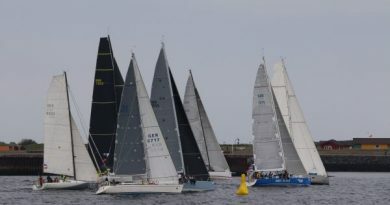 HotelPlanner.com Skipper Conall Morrison explains: “The first night at sea has turned out to be quite eventful. The common thread in all the Skipper Reports from Day 1 of Race 2 was how fondly they will remember their time in Punta del Este, Uruguay. Liverpool 2018 Skipper Lance Shepherd has Fernando ‘Nano’ Antia Bernardez, the first Uruguayan Clipper Race crew member, among his crew and summed it up best, saying: “The sights were gorgeous, the locals were friendly, and the beer was cold – what more could you ask for in a stopover? Clipper Race Meteorologist Simon Rowell reports the blustery conditions should ease this morning. He adds: “It’s quite unusual in that closer to the coast, the front is spreading out, and underneath that spreading cloud you’ll have diverging and very up and down wind.